Boyle's Law: The law states that volume is inversely proportional to pressure. Charles Law: This law states that volume is directly proportional to temperature. 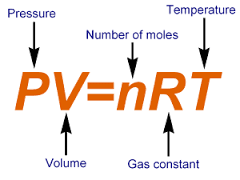 Combined Gas Law: On combing both the laws we get volume is directly proportional to temperature/ pressure. Avogadro's Law: According to this law, the volume is directly proportional to the number of moles. Gas particles behave as point masses. When particles strike the wall of the container, it is observed in the form of pressure. The collision between the particles is considered to be perfectly elastic i.e. no transfer of energy takes place. Interparticular space is very high so, there are no intermolecular forces of attraction. The overall energy of the particles remains the same. The kinetic energy of particles increases with increase in temperature. Any gas that follows the ideal gas equation is said to be an ideal gas. Any gas tends to behave as an ideal gas at a very low pressure and very high temperature.